Fast forward to proposal time. When Glenn Adam decided it was time to pop the question, he took Kayla on a hike with their dog and carved their initials in a tree. Then she saw the fanny pack on their pup that read “Will you marry my Daddy?” He got down on a knee and proposed. This bride and groom are very different people. She is super relaxed, while he is prone to stress. 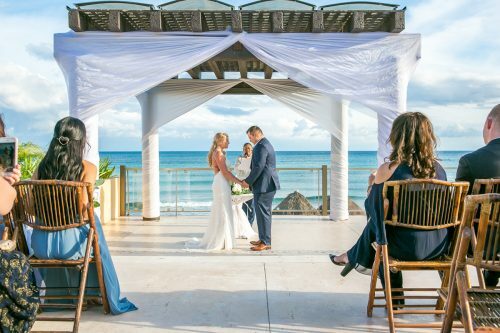 They chose to get married on the beach at the Now Jade Riviera Cancun instead of her initial vision for a grand wedding in the mountains because they wanted a stress-free wedding that everyone would actually enjoy. She set to planning a beach wedding with such a laid-back attitude that it would have driven him bananas if he had known the half of it! She let her bridesmaids pick any dress they wanted. She settled on her own beach wedding dress a week before leaving for Mexico! She knew what she liked with wedding décor but decided that if she didn’t find it, oh well – she wouldn’t search for it. She decided on their wedding songs while she was getting her hair and makeup done on the wedding day! Her advice to the brides-to-be out there? Roll with the punches. Things are going to happen that you have no control of! And she knows what she’s talking about. Kayla found a hole in her wedding dress the day before the wedding, her centerpieces broke on the airplane, and it was so windy on their wedding day that she had to ditch her homemade veil as she was walking down the aisle! 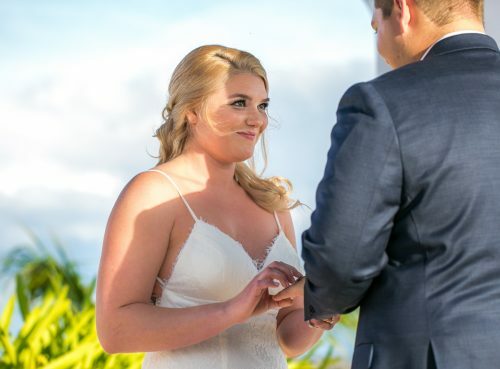 But as soon as she spotted her groom waiting for her at the altar, standing out over the Caribbean sea, nothing else mattered to her besides how happy and excited she was to be marrying him! Kayla & Glenn Adam, we wish you all the best in this next chapter of your adventure together, and we hope that you continue to bring balance and happiness to each other every day. Congratulations! 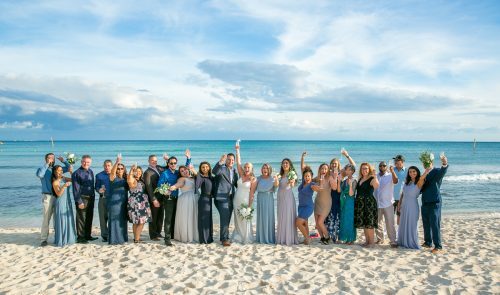 And if you are looking for the best Playa del Carmen wedding photographers for your beach wedding, then contact us today! 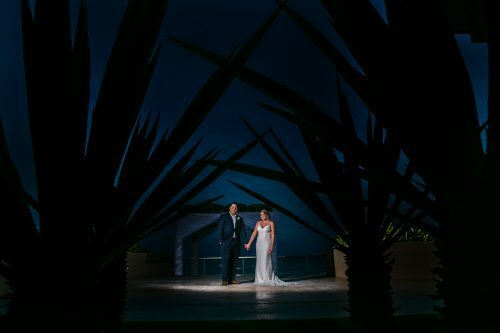 We are Fun In The Sun Weddings, the best photographers in Riviera Maya, Mexico. Marc was amazing! He made sure my husband (who hates pictures) and I felt comfortable! He made us laugh throughout the whole day! He made the whole shoot feel effortless and fun! Our pictures came out beautifully!! We will definitely work with them again when we are in Mexico! !